Do you have trouble drinking the recommended amount of water every day? I sure do, especially now in the middle of winter. I simply don't feel thirsty when my nose is froze! So how do we stay hydrated this winter? I've heard all the expert recommendations like adding cucumber, lemon, or fresh mint to your water. But those light, summery flavors just don't feel right in the winter. Plus I'm already cold! I don't want to drink cold or even room temperature water. I want hot chocolate! Ok, so just how many W's can I cram into one heading! Haa Haa. I do love alliteration. But seriously, here are 3 unexpected ways to meet your water quota and stay hydrated this winter. I find it so very comforting to wrap my hands around a warm mug of tea on a cold winter day. I smell the aroma of the brewing tea and my whole body relaxes into it. Plus the steam can help open my stuffy nose (an unpleasant side effect of dry winter air). In addition to their delicious flavor and comforting warmth, many herbal teas also have medicinal qualities. 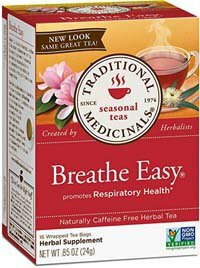 For example Breathe Easy by Traditional Medicinals is a tea I keep on hand for when my chest is feeling congested. Plus, it tastes lovely. TIP: When choosing herbal teas look for those that are naturally caffeine-free. Caffeine can dehydrate the body. Certainly not what we need in the winter! Did it ever occur to you that soup is mostly water?? Me neither. DUH right? But it is. 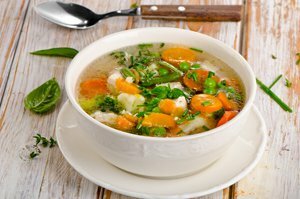 Vegetable and meat broth are both primarily water but also contain nourishing, immune-boosting minerals and other nutrients. Drinking them alone or using them as a base for soup or stew is a flavorful and warm way to reach your water intake goals. Try having a mug of broth first thing in the morning before or even (GASP!) in place of your morning coffee. You may find you feel even better with the broth than you do with the coffee. It's super simple to make your own broth. You can find lots of recipes all over the internet. One of these days I'm going to try making my own bone broth in my Instant Pot. I hear it's really easy but I haven't tried it yet, have you? Comment below if you've tried it and let me know your experience. I'm talking about eating foods with a high water content. Just like soups we tend to forget that we can get water from food sources. Obviously there isn't as much water in food as in drinks but it still helps keep us hydrated. Many of the foods with high water content like watermelon, cantaloupe and berries aren't in season in the winter but can usually be found. If you can't find them fresh at a good price then get frozen fruits and berries. They're still high in water content. You can gently warm them in the oven and sprinkle with a little cinnamon or clove for a warm dessert. Celery is high in water plus electrolytes. Snack on that instead of crackers or pretzels or add it to your morning green smoothie. 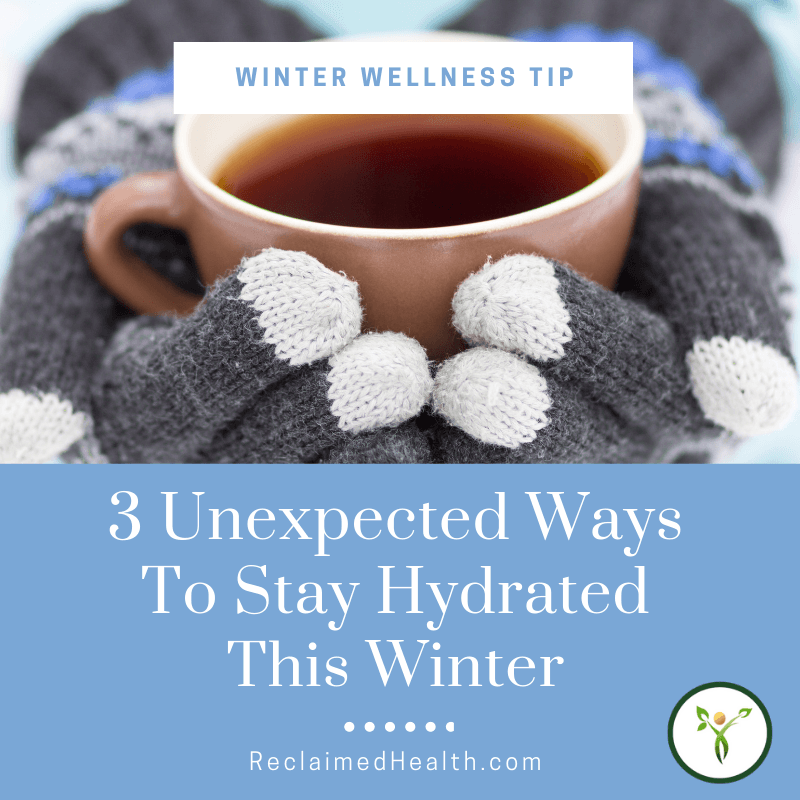 It's not that hard to stay hydrated this winter when you realize that water in your food and non-caffeinated drinks counts toward your daily water intake. You probably already have the ingredients for this creamy, satisfying winter drink in your pantry. So give it a try! Soak the raw (not roasted) cashews in water so they blend smoothly. You can either soak them in cool water 2-8 hours or hot water works in about 15 minutes if you need hot chocolate NOW! Once the cashews are nice and soft, drain them well and add to your blender. If your blender has a soup function you can heat it right there in the blender. Otherwise transfer to a small pot and warm gently on the stove. Cacao has a slightly better nutrient profile than coco but either will work. They both do contain some caffeine. If you prefer a caffeine-free option consider carob.